We passed right by this fairly inconspicuous 1965 Mustang Fastback on display at the SEMA Show quite a few times before taking a closer look, and we’re definitely glad we did. A look under the hood reveals…well…not what you’d expect. You see, the owner, Larry Gareffa, has converted the ’65 Fastback to electric power. Don’t worry – he didn’t yank out a perfectly good V8 to do the conversion, as the car didn’t have an engine when he took possession of it. Gareffa says the Mustang has a 25-30 mile range, and he can recharge the batteries at any of the local charging stations, prevalent at the local casinos, via a port hidden behind the grille. In case he needs to use a standard electrical outlet, he’s added a 120-volt plug behind the gas cap. It takes up to five hours to completely recharge the batteries from empty. He doesn’t know the exact horsepower rating, but he says it feels about like a vintage six-cylinder Mustang under full throttle. Gareffa hopes to see the project evolve, and is currently looking for sponsors to convert the car to lithium batteries. He says they would be half the weight of the lead-acid units and would boost his range to 70-75 miles. You can see Larry Gareffa’s electric-powered 1965 Ford Mustang Fastback in detail in the gallery below. 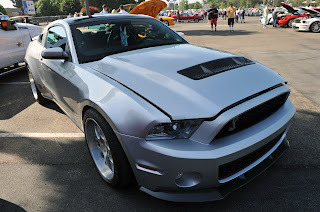 This entry was written by by Drew Phillips (Mustangs Daily) and posted here on Monday, November 11th, 2013 at 8:59 am and is filed under 1965 mustang, electric 1965 mustang, electric ford mustang, electric mustang, News, sema 2013. This article was not written by us, rather gathered using RSS feeds listed here. We take no credit for this article. You can leave a response, or trackback from your own site. business inside a scale disparate using availability of funds and resources to advance loans. view your business, and reacting into it in time, is oftentimes not enough. this web site as a finest web page for hottest updates. quality score if advertising and maeketing with Adwords. you get the best mobile email experience available.